There are some quirks - magnified by language, though the Italian train system tries to offer its services in English alongside Italian. Trenitalia offers three levels of trains: Regionale trains are the local trains - they run, mostly within a single region, as the name suggests - stopping at many small stations along the way. Slowest, due to the frequent stops, but also the least expensive option. No reserved seats. You can sometimes buy first class or second class tickets - first class has 3 seats in a row, second class has 4 seats in a row, but otherwise there's not much difference. (Not all trains have first class seating available). 'Freccia' trains (Italian for 'arrow') offer the fastest service - only available between major cities. You pay extra for the extra speed (up to 400 km/hr!). For instance, you can travel from downtown Rome to Venice in 3 hours and 45 minutes on a Frecciargento ('Silver Arrow') or Frecciarossa ('Red Arrow') for €50-75. Or spend 6 hours on an Intercity train for €57. Or you could take 11 hours (including 2 changes) on a series of Regionale trains for €42. I know which I would choose! You can book trips online and in advance - Tickets are discounted if bought online and in advance (and also if you purchase round-trip tickets). I've rarely done this - My travel plans are rarely so carefully organized that I want to commit to a specific train long in advance. (You may feel otherwise). 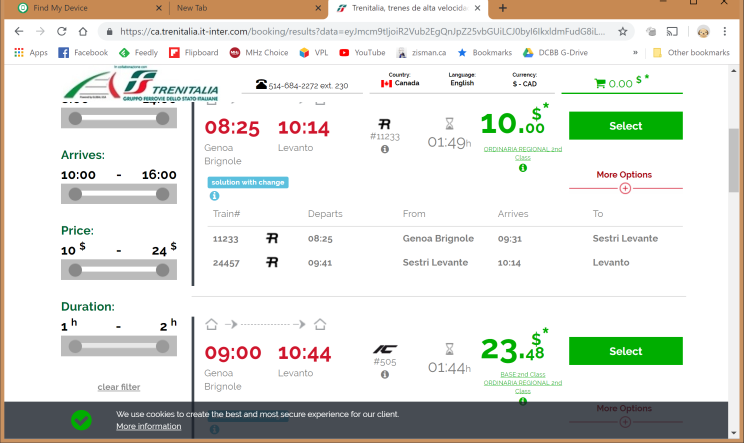 However, I do find Trenitalia's online scheduling information very useful and refer to it often - both before travelling and while I'm in Italy. It lets me know if there is train service where I'd like to go - and if so, how often it runs. If there are a couple of trains each hour, then I can be pretty flexible in my planning. 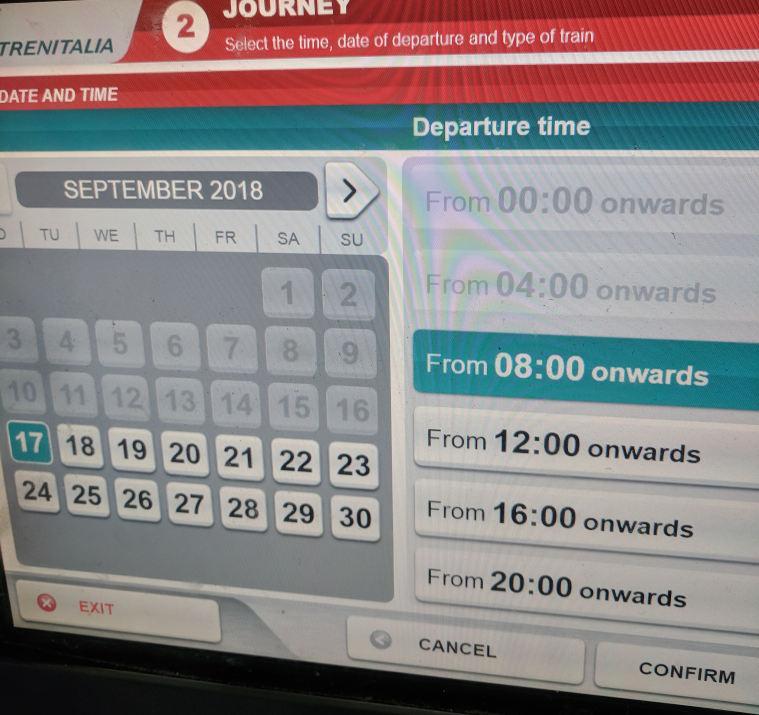 If there's just one train in the afternoon and one in the evening, though, I want to make sure I get to the station on time! 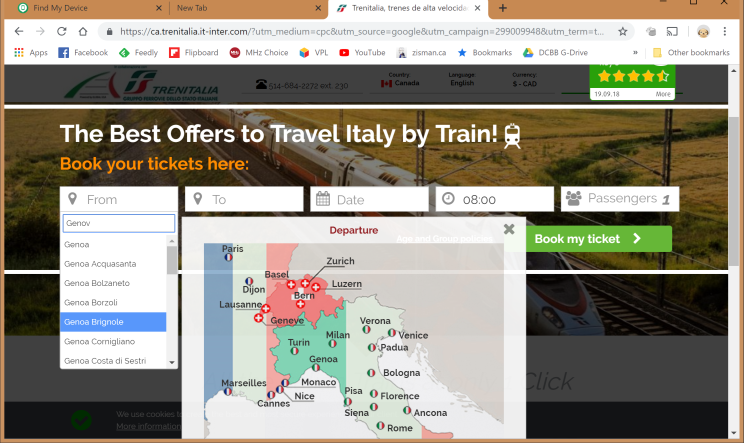 Trenitalia's website is available in English: https://ca.trenitalia.it-inter.com/ - you can customize it for your country, prefered currency, and language. New feature (Sept 2018) - you can now enter Italian city names with your choice of the English language name or the Italian name: Rome vs Roma, Florence vs Firenze, Venice vs Venezia, etc. Previously, even if you were using the English language version of the website, you needed to know and use the Italian version of city names. (The older English language page: http://www.trenitalia.com/tcom-en is still online and may work more efficiently - but requires you to use Italian-language city names - Roma, Genova, Milano, etc). The illustrations below were captured on the new page. 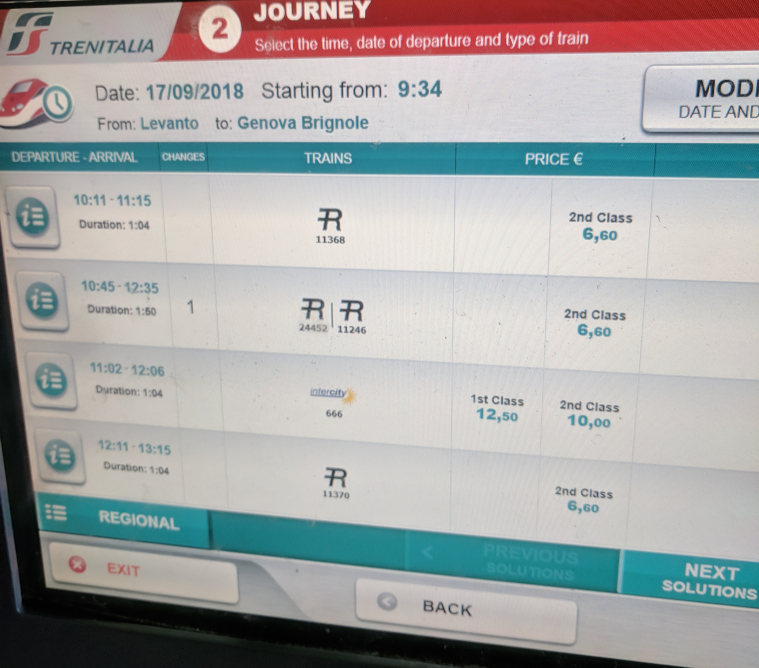 Here, on the Trenitalia English language home page, I've started to search for options travelling from the city of Genoa (Italian: Genova). As I started to type, in the From field, a list of possible stations appeared - I could scroll down it to pick a specific station from the list (Genoa lists 25 stations!) or just pick the city name to get all possible options. (You may want to do a bit of online research to see what's the main or most centrally located station). Repeat to choose a destination station (I want to go to the Riviera town of Levanto), date, and approximate time. 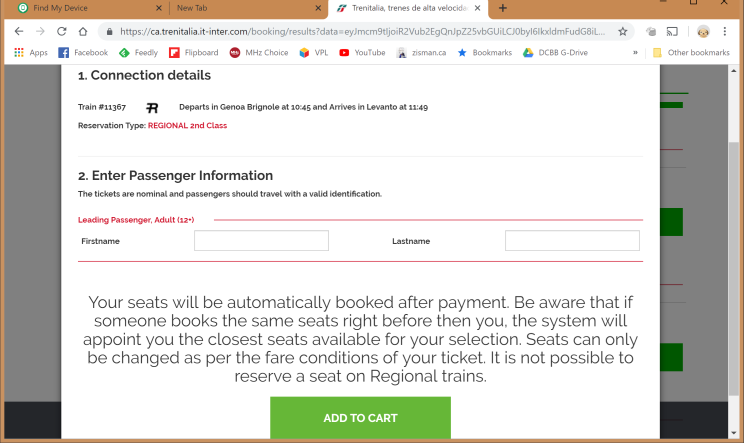 Clicking 'Book my ticket' (even though I'm just looking) gets a list of trains going from Genoa Brignole station to Levanto. I see a variety of options, slower Regionale options (with a change), an Intercity option for over double the cost. More if I scrolled down, including several direct trains. If I select one of the options, I'm offered more details and asked for my name in order to 'Add to Cart'. If I actually wanted to purchase tickets this way, I would need to provide more information including a credit card to buy the tickets. I don't want to actually buy my tickets right now - I was just checking online to see what was available. 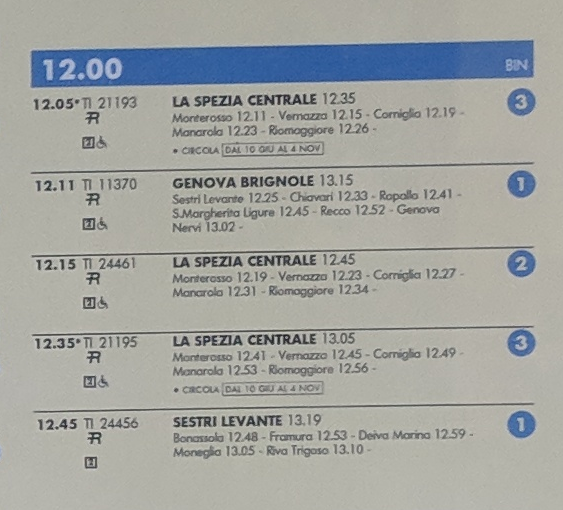 It looks like a lot of ways to get from Genova-Brignole to Levanto, throughout the day. Several trains each hour - for a trip that takes more or less an hour. 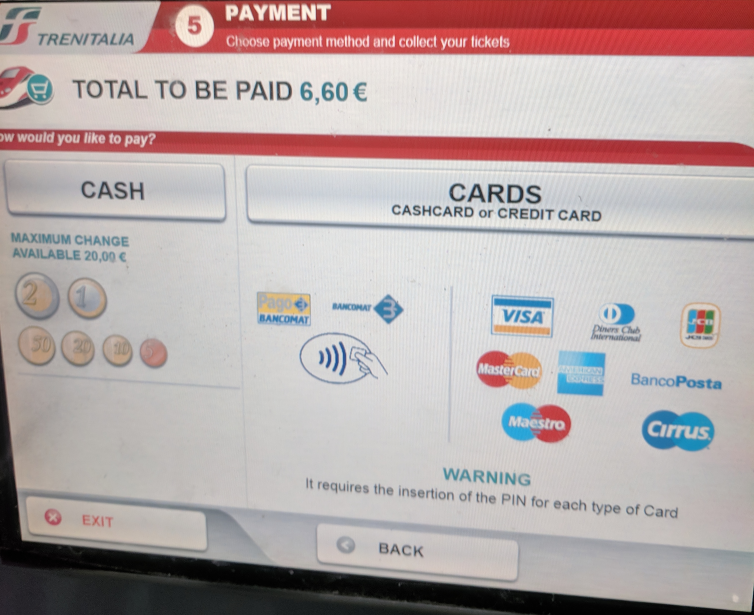 They feature touch screens - and the first screen includes a set of small flag icons along the bottom of the screen to change the language from Italian. Tap a finger on the UK flag icon to change the language to English. When you do that, you'll get a new screen - with a voice in delightfully Italian-accented English warning you to 'Beware of Pickpockets' - thus letting everyone in the station know that an English-speaking tourist is in their midst. 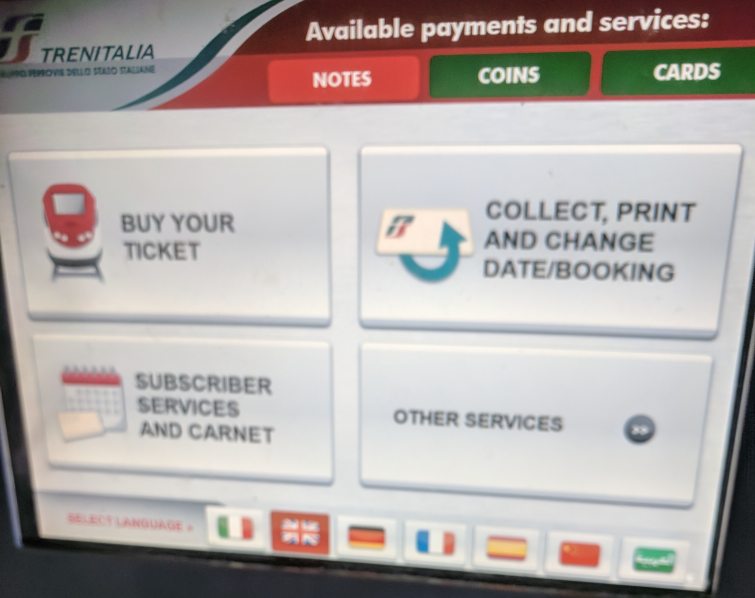 The ticket machines work similarly to the website, but with an older version of the software that doesn't let you use the English versions of Italian city names. You have to use Genova, Roma, Firenze, Venezia, Milano, etc. 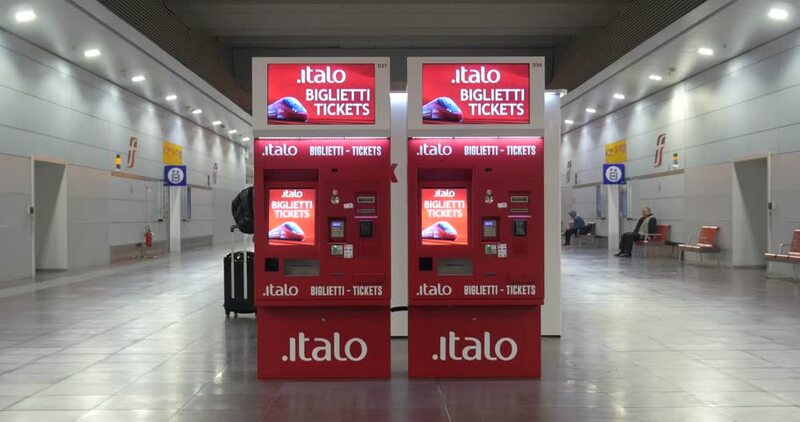 In larger stations, if you prefer, you can get your tickets the old fashioned way - from a ticket agent at a counter. But you'll probably have to wait in line and deal with someone who's English is only a bit better than your Italian. And many smaller stations have no ticket office - you'll just have to deal with a ticket machine. 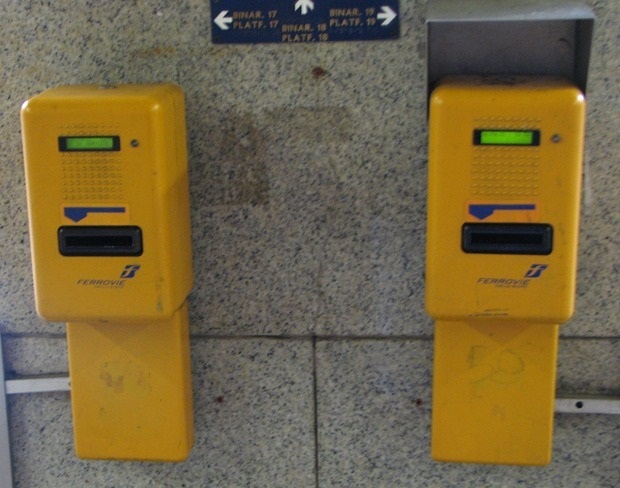 I took these photos at the station in Levanto, wanting tickets to return to Genoa (a.k.a. Genova). You can use the ticket machines to pick a station other than where you are now (in this case, Levanto) and for a different day than today - but I skipped those options - so I just need to choose an arrival station. As I started to type Genova, a list of possible stations shows up. Note that on the touch screen, I've found that touching the bottom of the buttons gives the best results. 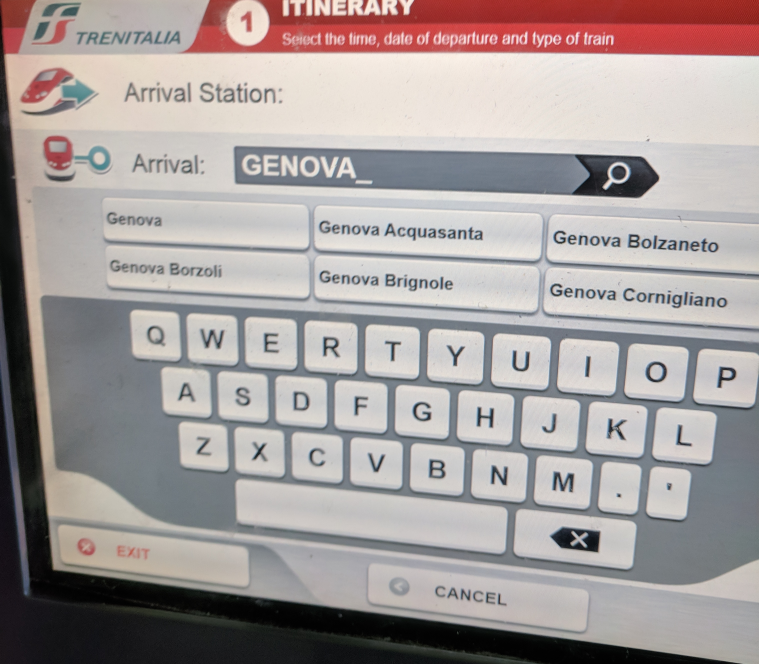 When you see where you want to go, touch the button - I want to go to Genova Brignole. After a screen where I confirm the date I want to travel and the approximate time, I get a list of possible trains - as on the website, a mix of regionale and intercity choices, direct trains or routes where I have to change trains. Various prices and various durations. The non-stop regionale trains take the same 1.04 hours as the more expensive intercity option. Since I picked a regionale train, I only have the option of a 2nd Class ticket - with no assigned seating. I can change the number of tickets I need - adults, children, and animals. (Dogs are allowed - muzzled and on leash). After a few confirmation screens, you're given a payment screen. You can choose cash, debit, or credit - inserting cash or your credit card in a section to the right of the screen. If you're paying by cash, change is given. If you're using a card, there's a separate number pad letting you enter your PIN. (You may need a card with an embedded chip). Finally, your tickets will be printed out. 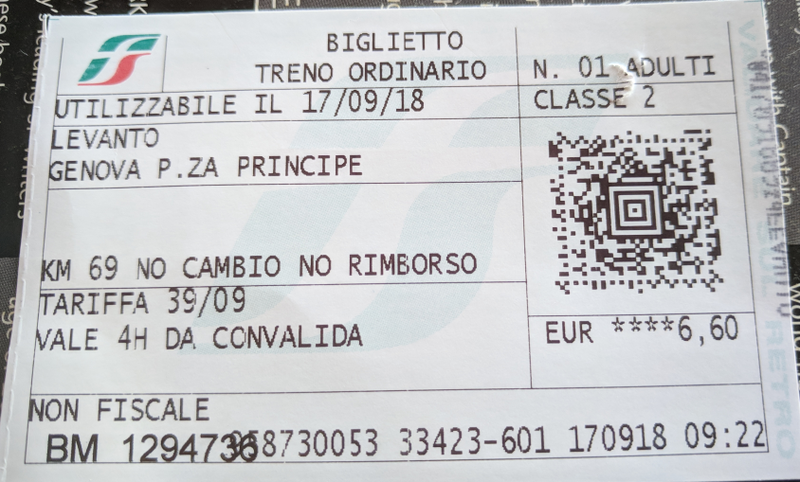 There are several style of tickets - here's an example of the larger style, for a trip from Genova Piazza Principe ('Partenza') to S. Margheritta ('Arrivo'). It gives the date ('Data') and time ('Ora') for both departure and arrival and that it's 2nd class. 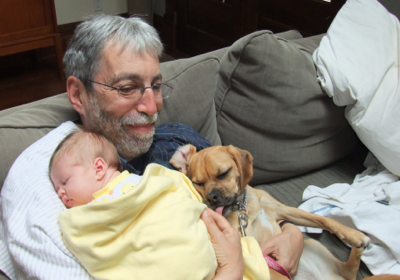 (Click to see a larger version). Important to note - Because this is on an Intercity train, there is assigned seating. 'Carrozza' indicates the number of the carriage (marked on the train door): Carrozza 006. 'Posto' is the seat: 63 Corridoio (aisle - Finestrino indicates a window seat). If your proposed trip requires that you change trains, you will get separate tickets for each leg of the trip. For instance, in 2017, we went from Varenna (on Lake Como) to Venice - we had to change trains in Milan. 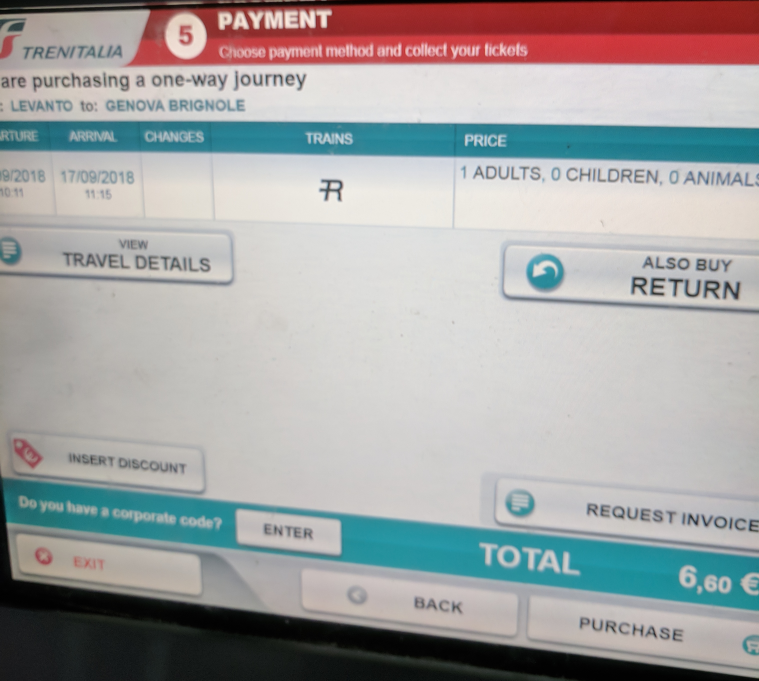 So the machine printed out two tickets - one for the Varenna-Milan train, the second for Milan-Venice. The second ticket included reserved seats. Note that you'll have to exit the first train, figure out the binario (track #) for the second train, and haul your luggage there, in some cases pretty quickly! Notice that each ticket has something printed along an edge. It didn't come out of the ticket machine with that. Before you use any ticket - train, bus, metro, etc, you have to validate it. Throughout the station, you'll see machines like these - note the two different styles: Each has a slot - insert your ticket (printed side up - it doesn't matter which end) and push it in as far as you can. Slide it to the left edge of the slot and you'll hear a bit of whirring. The date and time will be printed onto that edge of your ticket - validating it. Validating your ticket is a way to ensure that you only use your ticket once. (You similarly need to validate bus and metro tickets - bus tickets when you board the bus, metro tickets on a machine in the station - if you've bought a multi-use pass, you only need to validate it the first time you use it). On nearly every train trip at some point while the train is in motion, a conductor will come around to see your ticket - and to check that it's been validated. He or she may scan your ticket with a tablet. If you haven't validated your ticket, you are subject to a fine - being a foreigner or a tourist or not speaking Italian is not an excuse. Similarly, using a lower-priced regionale ticket on a more expensive train - or a 2nd class ticket in a 1st class seat - can result in you needing to pay the difference in fares plus a fine. You need to pay right then and there - the conductors accept cash, or can process credit cards even on a moving train. 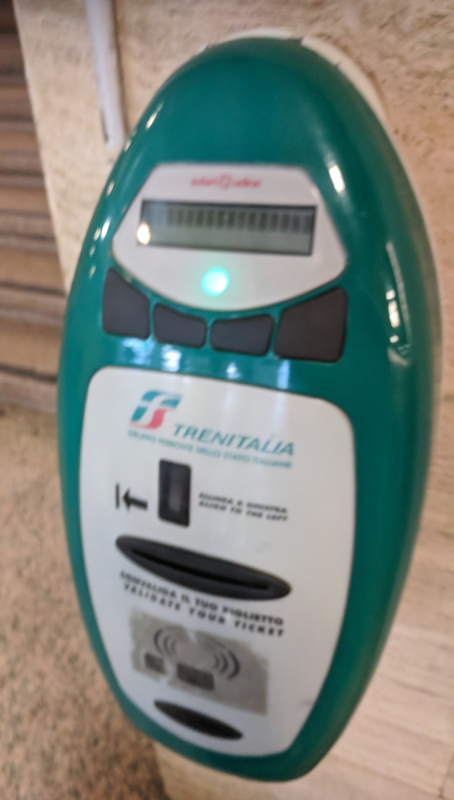 If you have multiple tickets (as in the Varenna to Venice trip I mentioned above) you'll need to validate each ticket - validate the second ticket when you get to the station where you're changing trains. (If you have a printout of a ticket ordered online or a digital version on a phone or tablet, of course you won't be able to shove that in a validation machine. The conductor will want to scan the bar code onboard the train). While the ticket has a lot of information (in Italian), there's one missing bit of information. Almost all train stations have multiple tracks. You need to know what track ('binario' in Italian) to go to in order to get on the right train. 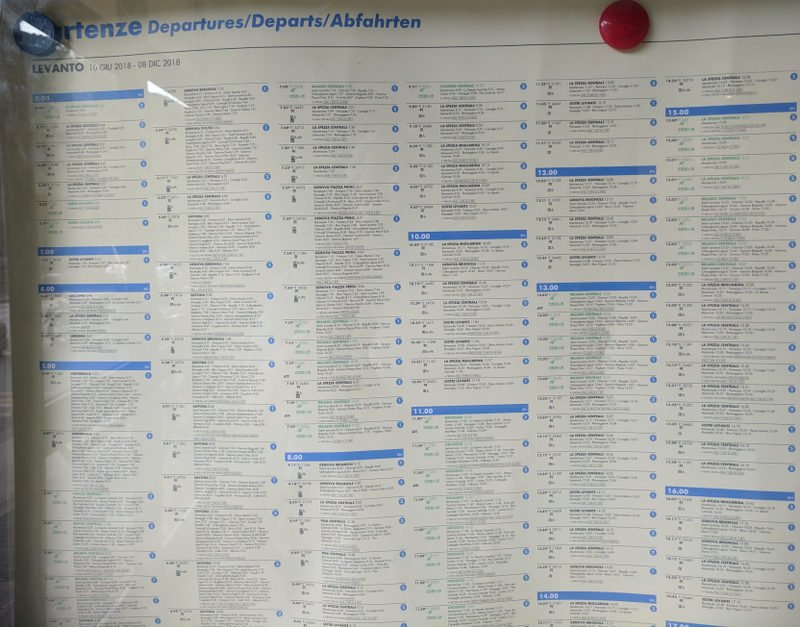 There are printed departure schedules (in yellow) posted around the station along with video screens for arriving and departing trains. Both of these list the binario where the train can be found. But in many cases, there's a catch. We've bought a ticket - in this case - from Santa Margheritte to Genova Principe. But when I look at the departures board, I don't see my destination listed. 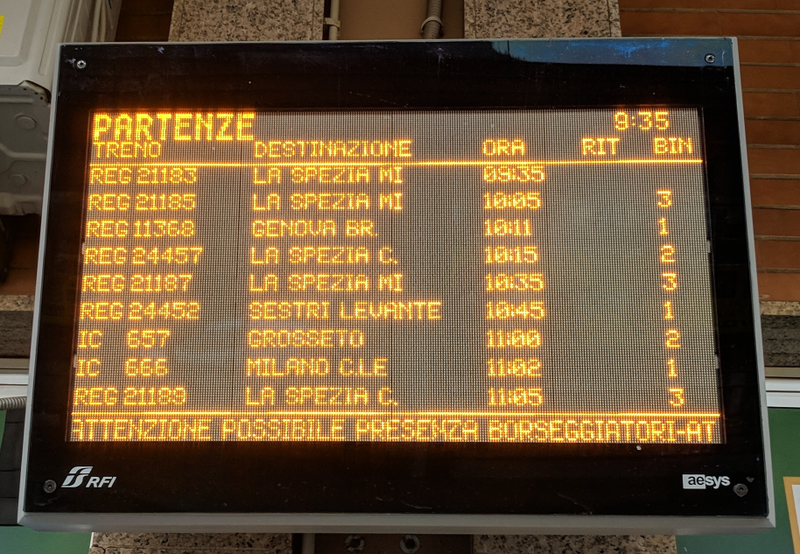 It turns out that the train I'm going to be travelling is ending up in Milan ('Milano') - Genova Principe is just one of the stations it will be stopping at. It's listed on both the yellow printed sheet and on the video screen as a train for Milano. But my ticket doesn't say that anywhere! How can I find the information I need? The larger ticket does give two pieces of useful information. One is the train number - on our ticket it's 'Treno 665'. The other is the departure time: 13.47. (The smaller ticket lacks that information - you might want to jot the departure time down on a scrap of paper when you're buying the ticket). Here's a blowup of a section of the departure schedule.... you'll see the trains leaving this station startiong at 12.00 (noon) - check the departure time; the final destination of each train is in big letters, below that are the various stops, along with the scheduled arrival times. Hopefully you can find which train you have a ticket for. Along the right, the numbers on the blue circles indicate the track number ('Bin' for 'binario'). But there's another possible problem. Sometimes the binario has changed - after the poster has been printed. So double-check by taking a look at the up to the minute video screen. There's typically a large screen in the lobby of the station, with smaller versions at various places around the station, including alongside the tracks. 'Partenze' = Departures. Again, this is showing the final destination of each train - which may or may not be where you're going. Beside that 'Ora' (hour) indicates the scheduled departure time. 'Rit' indicates whether the train is late ('ritardo'). 'Bin' for 'binario' is the track where you can get on the train. In many stations, in order to get to any binario other than track 1, you'll need to go down to an underground passage below the tracks, then back up to your desired track. There may be an elevator - but be prepared - you may need to drag your suitcase down and then up a flight of stairs and along a corridor. (And repeat the process when you arrive at your destination). This is one reason to try to get to the station with time to spare - and can be a problem if you're rushing to make a tight connection. A few times, the binario has changed shortly before the train arrives - there should be a notification on the P.A. system about this - in Italian and then in English... so stay alert. we were in a suburban station outside Rome and suddenly, after an announcement that we hadn't understood everyone left the track except us. We finally looked at the screen and realized that our train was coming to a different track - we had to scurry with out baggage to get to the right place in time. On the tracks there is usually another video screen showing the next train to arrive - and in small print scrolling through the various stations where that train will stop. You can check to make sure your destination is listed. There will be an announcement - in Italian and then in English - shortly before your train pulls up. So you've validated your ticket (if you forgot, there's usually a validation machine somewhere on the track), found your binario, and dragged your baggage along. And finally your train has arrived! Note that most train carriages have a big number 2 on the side - this isn't the number of the carriage - it indicates that it's a 2nd class carriage. A few carriages near the front have a number 1 on them - these are for first class passengers. Frankly there's not much difference - wider seats in first class. But no complimentary glasses of prosecco. (Still, when the difference between 1st and 2nd class is nominal, we've sometimes purchased 1st class tickets). If you have a reserved seat, find the right carriage - the number is often on a piece of paper taped to the window on the door. There's a conductor alongside the train who can help you if you have questions. Get onboard and find your seat. If there's no reserved seating, sit anywhere you like. There is usually an open baggage area at the end of the carriage and often a baggage rack in the middle. There are overhead places for baggage - it can be a chore getting a big suitcase up, but fellow passengers will often offer to help. In some cases, you can squeeze a suitcase in the space between two seats. The photo was taken in a second class carriage of a regionale train. It's reasonably comfortable - certainly more so than economy class on a plane! Clean, modern. Just fine. You may find older carriages on some of the secondary routes - don't blame me if your train doesn't look like this. On the other hand, Intercity trains will be a bit fancier, often with multiple levels. 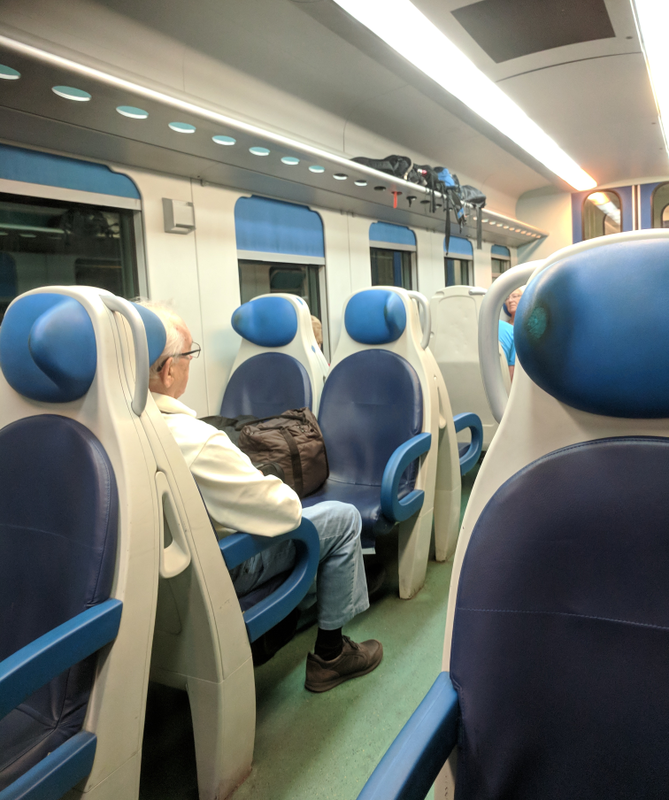 And the high speed Freccia train interiors are positively space age, with video screens reporting the train's current speed, which can be reach up to 400 km/hour or so as the train speeds through the countryside. Several cities have suburban train lines that integrate with those cities' local bus or metro systems. For instance, in Rome, there's a train line that starts in a station right beside the Piramide metro station and runs down to the Ostia beach resort town. Your Rome metro ticket can be used for these trains (and vice versa) - no additional ticket needed. 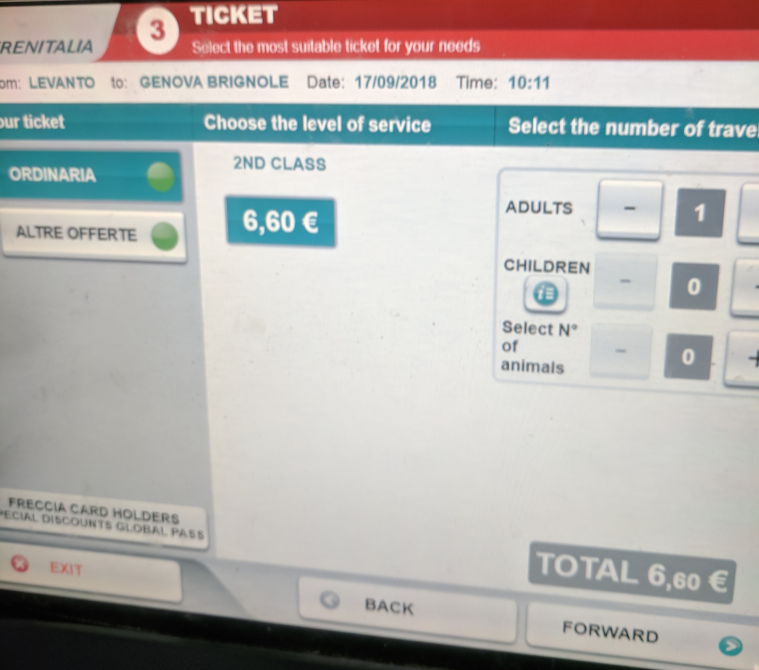 In Genoa, a train line runs through western and eastern suburbs - tickets to these stations currently costs a modest €1.60 - and can be used for additional travel on the city's bus/metro/funicular/elevator network, replacing a €1.50 bus ticket. 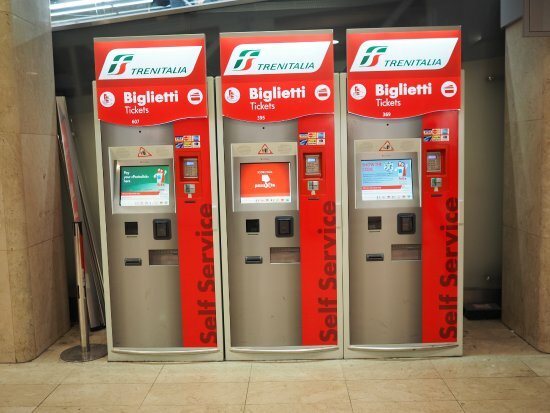 The trick - the standard Trenitalia ticket machines in these suburban stations (which also service the national trains) look like they'll sell you the needed ticket - but then don't show any available trains - instead, buy your ticket from a ticket agent (if the station has one) or from a 'tabachi' - the vendor of cigarettes, who also sell bus tickets in most Italian towns. The Genoa Nervi station has a tabachi stand right inside the station, for instance - in Roma-Piramide, there's a tabachi inside the metro station, right beside the exit. I hope you've found this helpful - and that you have a great trip. Email me if you have questions or comments.